Join the bestselling author of Ciao, America! 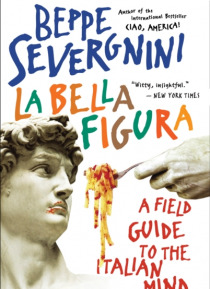 on a lively tour of modern Italy that takes you behind the seductive face it puts on for visitorsla bella figuraand highlights its maddening, paradoxical true selfYou wont need luggage for this hypothetical and hilarious trip into the hearts and minds of Beppe Severgninis fellow Italians. In fact, Beppe would prefer if you left behind the baggage his c… rafty and elegant countrymen have smuggled into your subconscious. To get to his Italia, youll need to forget about your idealized notions of Italy. Although La Bella Figura will take you to legendary cities and scenic regions, your real destinations are the places where Italians are at their best, worst, and most authentic: The highway: in America, a red light has only one possible interpretationStop! An Italian red light doesnt warn or order you as much as provide an invitation for reflection. The airport: where Italians prove that one of their virtues (an appreciation for beauty) is really a vice. Who cares if the beautiful girls hawking cell phones in airport kiosks stick you with an outdated model? Thats the price of gazing upon perfection.The small town: which demonstrates the Italian genius for pleasant living: a congenial barber . . . a well-stocked newsstand . . . professionally made coffee and a proper pizza; bell towers we can recognize in the distance, and people with a kind word and a smile for everyone.The chaos of the roads, the anarchy of the office, the theatrical spirit of the hypermarkets, and garrulous train journeys; the sensory reassurance of a church and the importance of the beach; the solitude of the soccer stadium and the crowded Italian bedroom; the vertical fixations of the apartment building and the horizontal democracy of the eat-in kitchen. As you venture to these and many other locations rooted in the Italian psyche, you realize that Beppe has become your Dante and shown you a country that has too much style to be hell but is too disorderly to be heaven. Ten days, thirty places. From north to south. From food to politics. From saintliness to sexuality. This ironic, methodical, and sentimental examination will help you understand why Italyas Beppe sayscan have you fuming and then purring in the space of a hundred meters or ten minutes.